People looking for custom or stock springs needed and deserved a more efficient way to search, design, and obtain instant quotes on their custom and stock springs. Our Purpose has been to empower our customers and improve the quality of their spring experience by arming them with the tools, apps and information they need to make an intelligent spring decision. We had always known searching for springs and finding the right spring was a difficult task that’s why we created Acxess Spring. We knew we had to raise the bar significantly in our industry and create a company that gave its customers the tools, apps, and technical knowledge combined with real time instant quotes to help guide our cherished customers through the complicated task of locating the perfect spring for their application. ...to achieve a company that really gives its customers an easy way to find their springs. 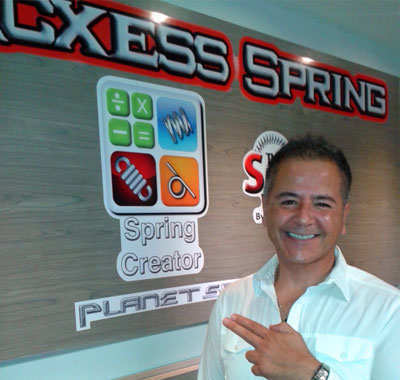 We invite you to use our tools like “Spring Creator” to design your custom spring easily as well as finding the perfect stock spring by using our “Spring Finder” tool at "The Spring Store" with over 24,000 different stock springs. Our Industry 1st “Custom Spring Instant Quote” gives you a real time instant spring quote in seconds. What became our all consuming determination to build a better mouse trap has become our humble gift to you. We hope you enjoy your spring experience with us for it is our passion and responsibility to you our loyal customers who have given us so much that we are so very thankful for. "Our resolve to never cut corners for nothing worthwhile is ever easy. "Be prepared for unexpected hardships. Choose to make lemonade and bend obstacles into opportunities." "Remember to enjoy the ride. Everyday on Earth is a gift to be cherished and used wisely."